The Hubway bike rental specifically targets short trips, anything under 30 minutes is part of the membership fee (either a year, 3-day or 24 membership). This seems to suit most users, with 43% finishing within 15 minutes and 62% finishing in 20 minutes. After the first 30 minutes additional fees are incurred (with a 20% discount for registered riders). The data below shows the % of trips with different durations and the fees an unregistered rider would incurr. 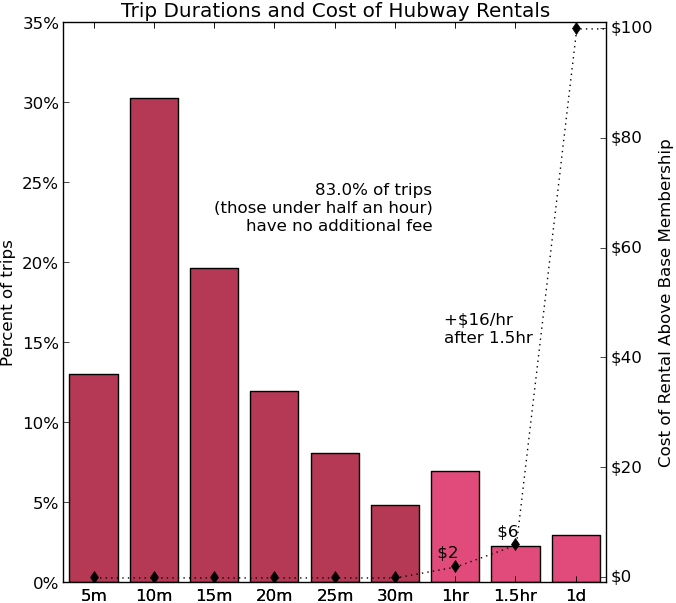 Note that local bike rentals are around $40/day and Hubway even recommends places to go for longer rentals. I also saw in a previous post that some trips are being made pretty much from all stations to all other stations, which I suspect means there are trips that can’t be easily made on a Hubway bike in traffic in 30 minutes. Note, I would like to represent this data with a cumulative bar chart and something with the cost more proportional to the number of trips that paid it. 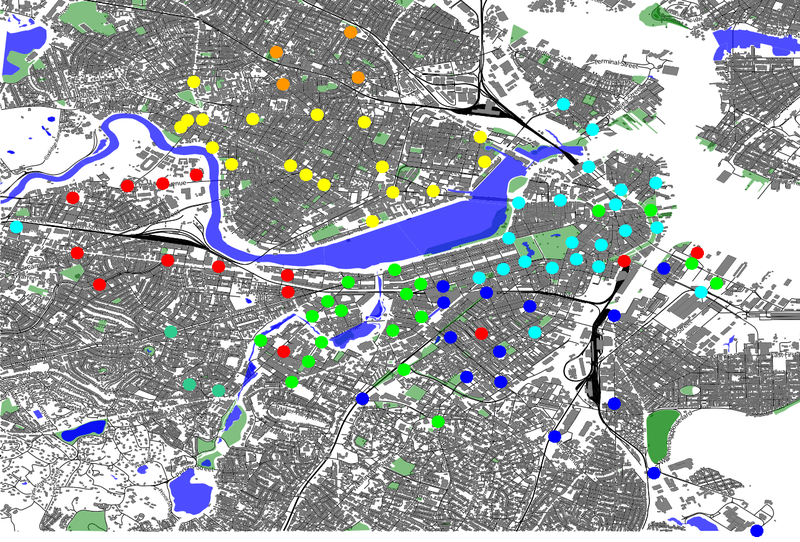 This entry was posted in Visualization and tagged Hubway on October 25, 2012 by Zia. 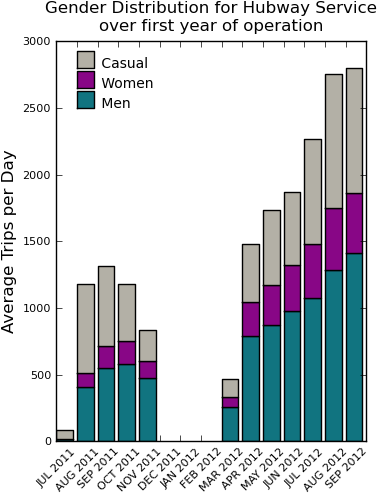 I took a closer look at the Hubway trips data for August 2012 data (busiest month on record with average of nearly 3,000 trips per day) and was surprised that almost all stations were connected by some trips. 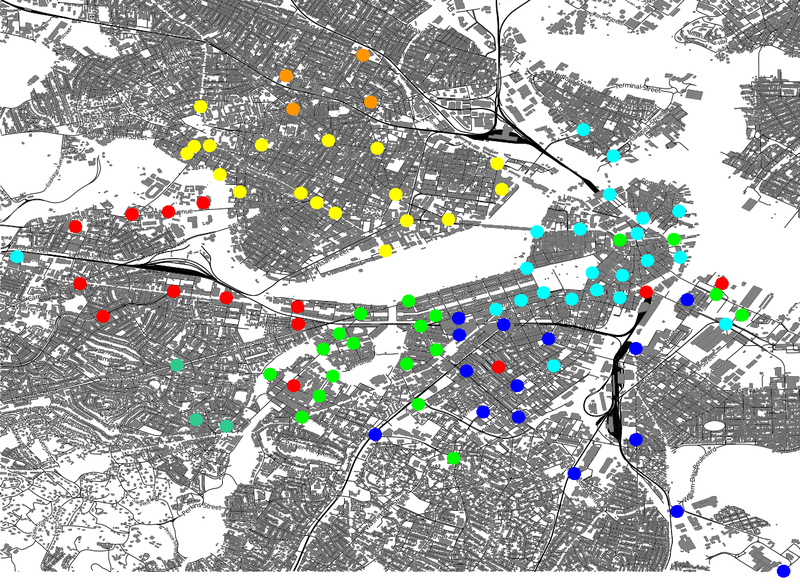 Also with clear clustering for TD Garden (North Station) and South Station, Harvard and the diagonal representing round-trip rentals. Other symmetry on the diagonal likely representing commuters going from one destination to another and back again later. The cluster on the diagonal over the whole data set highlights the 6.93% of trips which return to the same location. 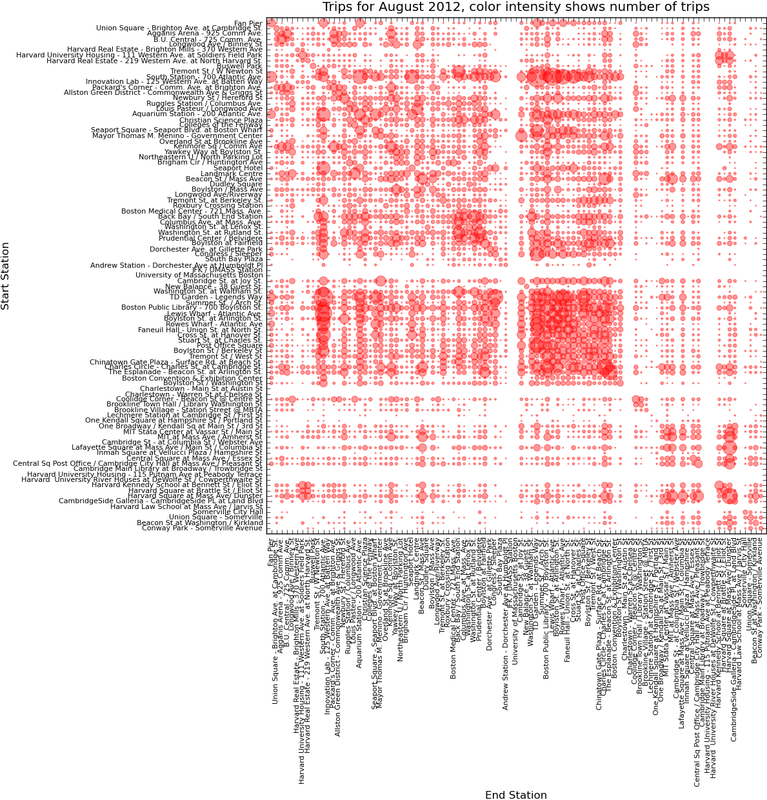 This figure was generated with matplotlib and data processed in python. Unused stations were likely not opened yet in August. This entry was posted in Visualization and tagged Hubway on October 22, 2012 by Zia. Looking at the gender distribution of users, the data is not very interesting. Aside from an initial ramp up as users registered in the first few months, things seem pretty stable at between 10-18% Women and ~50% Men with the rest unregistered (no gender information available). I used cPickle to serialize my python representation of the data to store and retrieve the processed data. Useful to speed things up. For the record below is the ugly default legend which looked terrible on the plot. This entry was posted in Visualization and tagged Hubway on October 16, 2012 by Zia. This entry was posted in Visualization and tagged Hubway on October 15, 2012 by Zia.